Ukrainian Catholic University in Lviv has long understood that one of its foundations is martyrdom. When I first visited Lviv, the principal city of western Ukraine, in 2002, the transportation from plane to airport terminal was an old bus towed by a Soviet-era tractor; today, the airport is a model of cleanliness and efficiency. In 2002, the Old Town was shabby and begrimed; today, it’s become a major tourist destination, and while there is still more clean-up to do, the charms of an old Habsburg city are beginning to reveal themselves. To sit in a downtown restaurant and speak with the city’s mayor about his plans for further development, it’s easy to forget that you’re in a country at war. 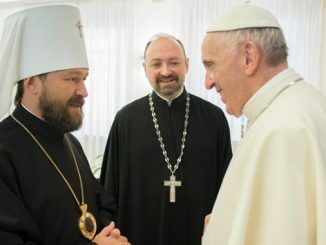 There, Father Stepan Sus of the Ukrainian Greek Catholic Church is running an urban ministry so dynamic that he has twenty other priests working with him. The church itself is full of architectural and decorative interest: built in the Baroque style the early seventeenth century as the city’s “Jesuit Church” (and therefore modeled on the Church of the Gesù in Rome), Sts. Peter and Paul long served as a center of military chaplaincy for the Austrian and Polish troops garrisoned in Lviv. Then, in 1946, the property was seized by the Soviet regime and the church was turned into a book depository in which some two million volumes were stored. After the Soviet Union collapsed in 1991 and Ukraine achieved independence, there was a fuss over ownership and it was not until 2010 that the church was deemed the property of the Greek Catholic Archeparchy of Lviv. 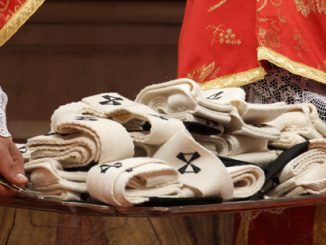 Father Sus is full of energy, and on both weekdays and Sundays, the church celebrates the Divine Liturgy several times, with confessions available for over 11 hours each day. But when Father Sus takes you to a small memorial to the left of the church’s entrance, his mien becomes more sober and you begin to understand that the vibrant ministry underway at this site of ecclesial resurrection has its costs. For there, amidst shell casings, bits of shrapnel, spent bullets, and an icon, are the pictures of the young men of the parish who have been killed in the war Russia has been conducting in the Donbass region of eastern Ukraine since 2014. 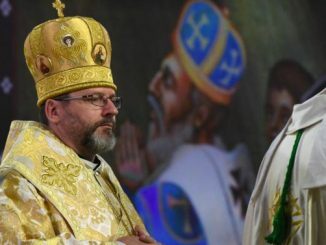 Since the invasion of the Donbass by Russian “little green men,” Father Sus has conducted 76 funerals in the garrison church. Each of those young lives, sacrificed to defend a country against an aggression the West would prefer to ignore, is a powerful and poignant reminder that freedom is never free. So is the memorial to Bohdan Solchanyk in the foyer of one of the sparkling new buildings that grace the campus of the Ukrainian Catholic University in Lviv. UKU (as it’s known from its initials in transliterated Ukrainian) is another marvel. The only Catholic institution of higher learning in the former Soviet space, UKU was a dream 25 years ago. Today, it’s a stunning reality — the most highly-rated university in Ukraine on several indices of accomplishment, thanks to the work of an extraordinary faculty and administrative team first assembled by Bishop Borys Gudziak. 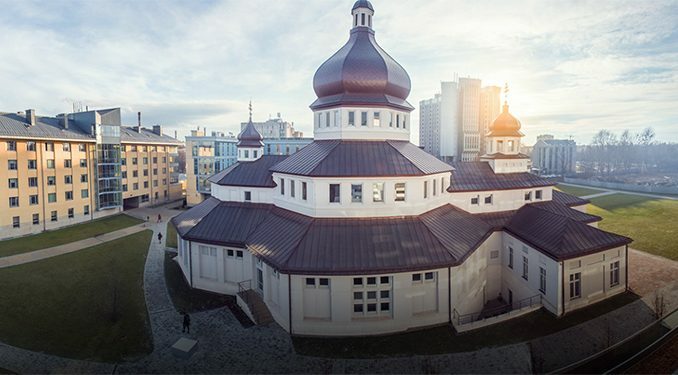 UKU is a university that takes Catholic mission with utmost seriousness: in this case, the mission to heal and evangelize a society still traumatized by more than seven decades of communism, war, and the Soviet attempt to destroy Ukraine’s national identity. 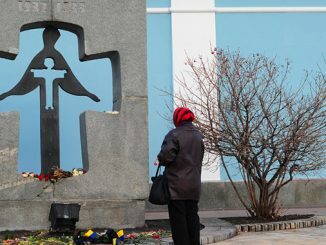 The university has long understood that one of its foundations is martyrdom, for the Ukrainian Greek Catholic Church was brutally persecuted after World War II and gave the faith thousands of many witnesses-unto-death. When Bohdan Solchanyk, a history lecturer at UKU preparing his doctorate and engaged to be married went to Kyiv in 2013 to participate in the nonviolent demonstrations we now know as the Maidan Revolution of Dignity, he was certainly aware of that foundation. Then he, too, became a martyr, shot through the head by a sniper as he peacefully called for a Ukraine cleansed of corruption in society, culture, politics, and economics. “The war in the Donbass is real, however, and the West needs to take it far more seriously.” OK, true enough. But how? It seems there should have been a section-two of this article. 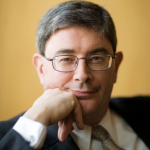 Perhaps this is not the venue for such a discussion as this is not the Catholic “War” Report. But Ukraine is being pushed by a “hybrid war” and this “forgotten conflict” means forgotten Catholics. I would like to hear more about the effect of Pope Francis’ visit to Santa Sophia in Rome and what comes next. Sad but true. Sad -AND true.